The coat has a single-breasted front with a slide fastener closure and a secondary hook and loop fastener tape closure; a band collar; long sleeves with cuffs and one (1) button, three (3) buttonholes adjustable cuff tab; and a bi-swing back. The front has two (2) angled chest pockets with flaps with hook and loop fastener tape closures. Above each chest pocket there is loop tape to accommodate the Name and US Army Tapes. The front placket has a loop tape for the Rank Patch. 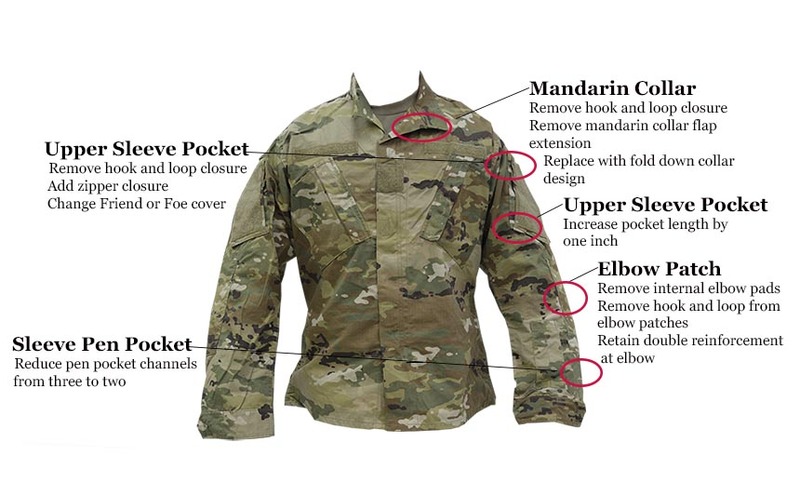 The coat has two (2) bellow style upper sleeve pockets and includes an eyelet drain-hole and loop fastener tape on the outside of the pocket. Each sleeve pocket has a slide fastener (zipper) closure on the front side (as worn). The coat sleeves have an elbow reinforcement patch. Both sleeves have an Identification Friend or Foe tab cover that can be opened and closed using hook and loop fastener. The IFF tab cover is centered and sewn onto the sleeve above the upper sleeve pocket. The left sleeve has a two (2) channel pencil pocket. The coat has a double turned and cleaned finished hem. The trouser design shall have a waistband with clean finished ends and button/buttonhole closure. Trousers shall have seven (7) belt loops along with a covered fly with three (3) buttons and buttonhole closure. They shall have two (2) side hanging pockets, two (2) back single welt hip pockets with two (2) button closure flaps, two (2) front side pleated cargo pockets with three (3) buttons/two (2) buttonholes closure flaps and two (2) lower leg pockets with one (1) button/buttonhole closure flaps. They shall have side cargo pockets and lower leg pockets that have sewn-in eyelets at the bottom of each of the bellows. 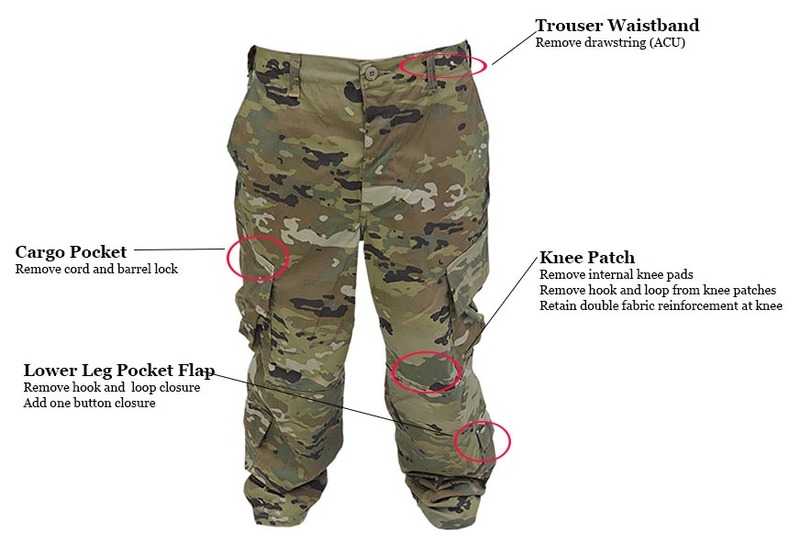 They shall have a double needle seat patch and shall have knee reinforcement patches. They shall have a drawstring at each leg bottom.